This extremely spacious property has great curb as it stands proudly at the front of its plot. The property is set over three floors and still has a loft space that could be converted although it probably wouldn’t be needed given the amount of space the house has. To the front of the property there are two entrances, one into an entrance hall and the other into the garage. Entering via the garage we have a door leading to one of the kitchens. This kitchen needs completely remodeling as most of the cupboards are not in a fit state to be used. It is a good size though and it has a pantry as well. Off of the kitchen is a large hallway with a bathroom to the right and the stairs leading upstairs. To the left there is a bedroom with doors leading outside. Further along is a study to the right and a small single bedroom to the left. At the end of the corridor is the wine press with stairs leading downstairs to the “adega”. Now going up to the first floor. Standing at the top of the stairs, to the left we have the second kitchen which has a door leading out to the veranda which has marvelous views over the countryside. Across the hall is the living room which also has patio doors out to a veranda. On this level there is a further 3 bedrooms and a massive family bathroom. 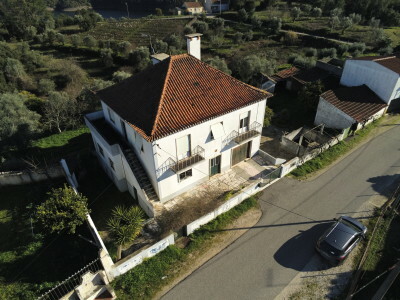 The property’s plot is set over terraces and has a great variety of fruit trees. There is also a borehole and a well.